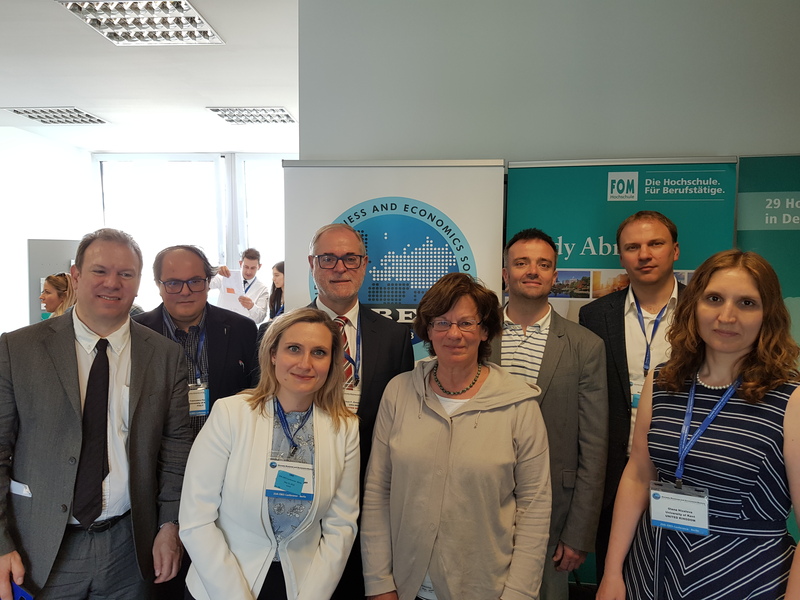 The 25th Conference of the Eurasia Business and Economics Society (EBES) took place on May 23-25, 2018 in Berlin/Germany. 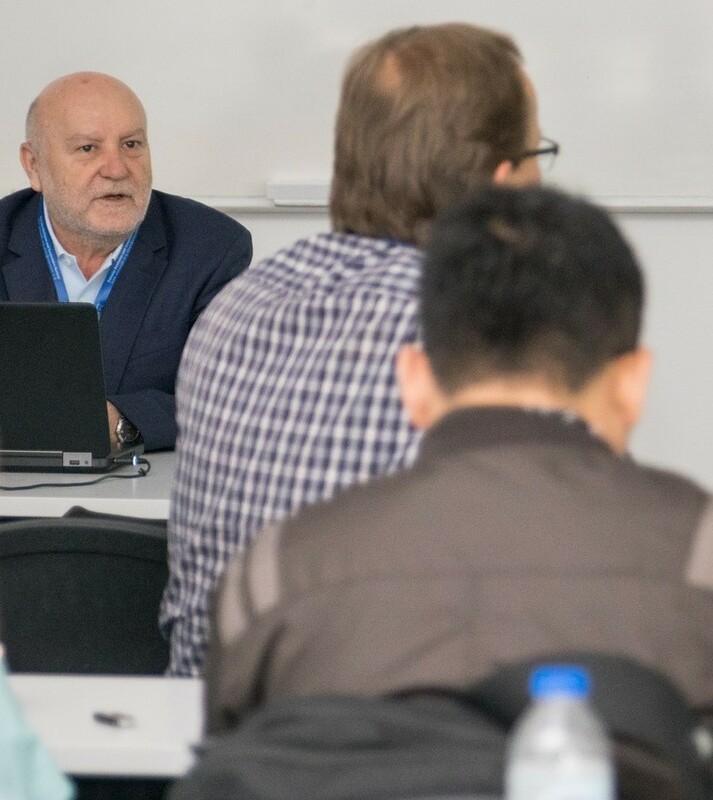 It was jointly organized with the Global Labor Organization (GLO) and hosted by the FOM University of Applied Sciences in their Berlin study center. 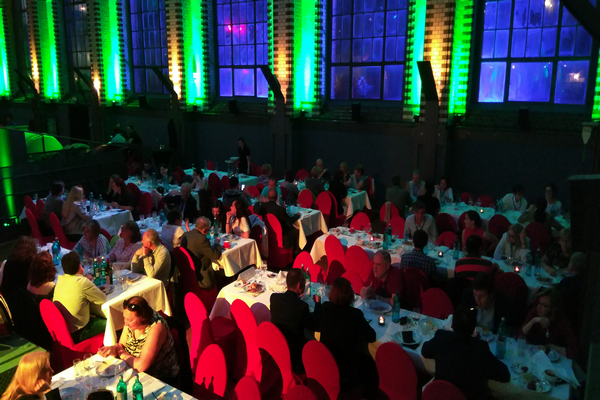 During the conference, 316 papers by 525 researchers from 60 countries were presented. On May 23, GLO had organized three sessions reviewing research on (i) Africa, (ii) well-being and (ii) the research agenda of a selection of various GLO clusters presented by the GLO Cluster Leads. 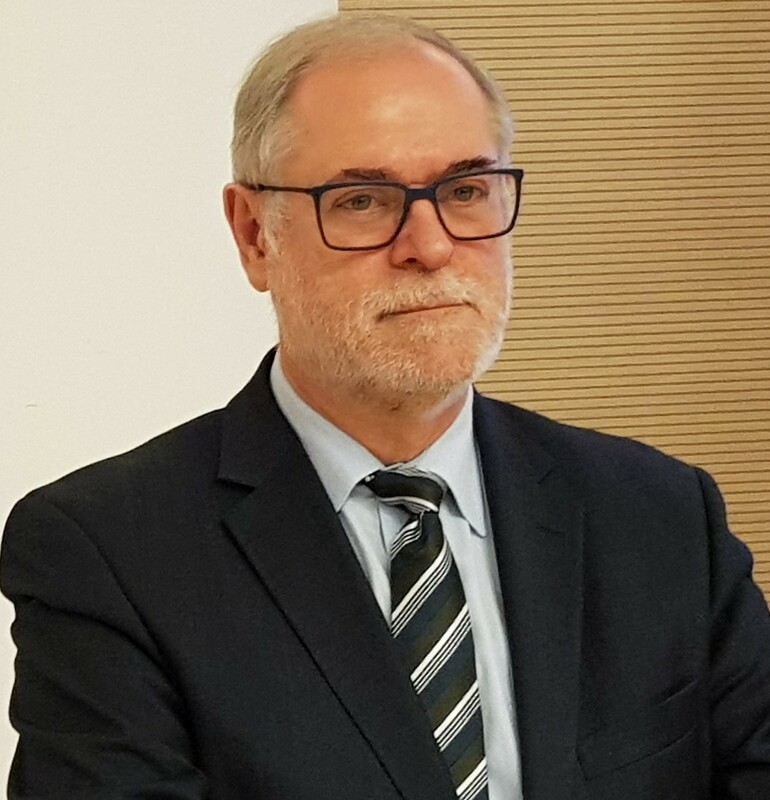 EBES has given the 2018 EBES Fellow Award to GLO President Klaus F. Zimmermann. Further information can be found here: Conference call; EBES Fellow Award; GLO Activities; Highlights EBES. Family picture from the left: Marco Leonardi (GLO Cluster Lead Labor Reform Policies and University of Milan); Francesco Pastore (GLO Cluster Lead School-to-Work Transitions and University of Napoli); Milena Nikolova (GLO Fellow and University of Groningen); Klaus F. Zimmermann (GLO President and UNU-MERIT); Kea Tijdens (GLO Fellow, University of Amsterdam and WageIndicator Foundation); Corrado Giulietti (University of Southampton, GLO Research Director and GLO Cluster Lead Chinese Labor Market); Martin Kahanec (Central European University and GLO Cluster Lead EU Mobility); and Olena Nizalova (GLO Fellow and University of Kent). In the back: Ugur Can (EBES Director and GLO Fellow), working. 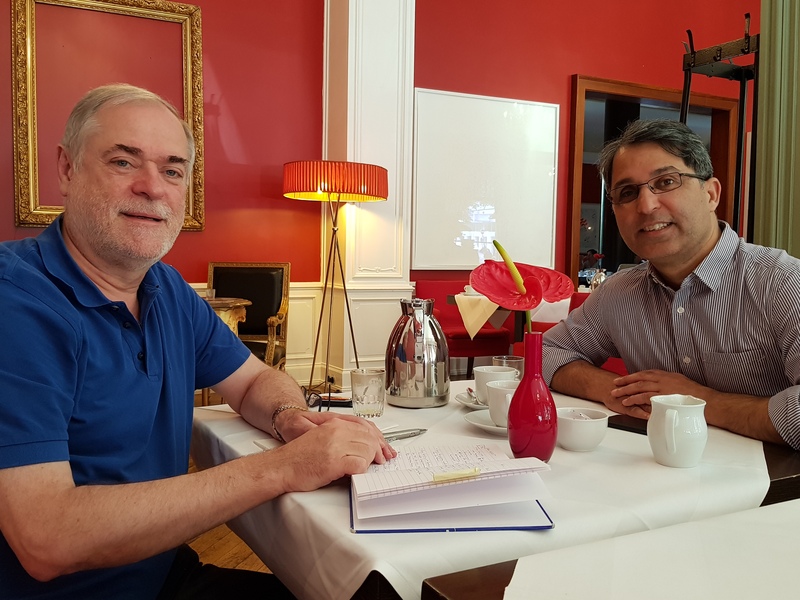 From the right: Matloob Piracha (University of Kent and GLO Managing Director) and Klaus F. Zimmermann discussing GLO perspectives for the years to come. 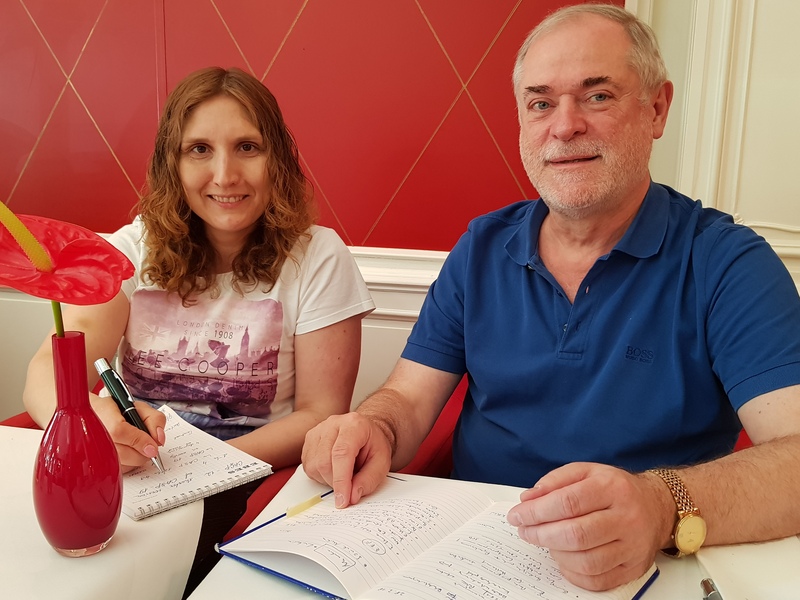 From the left: Olena Nizalova (GLO Fellow and University of Kent) and Klaus F. Zimmermann discussing further GLO research initiatives on happiness. 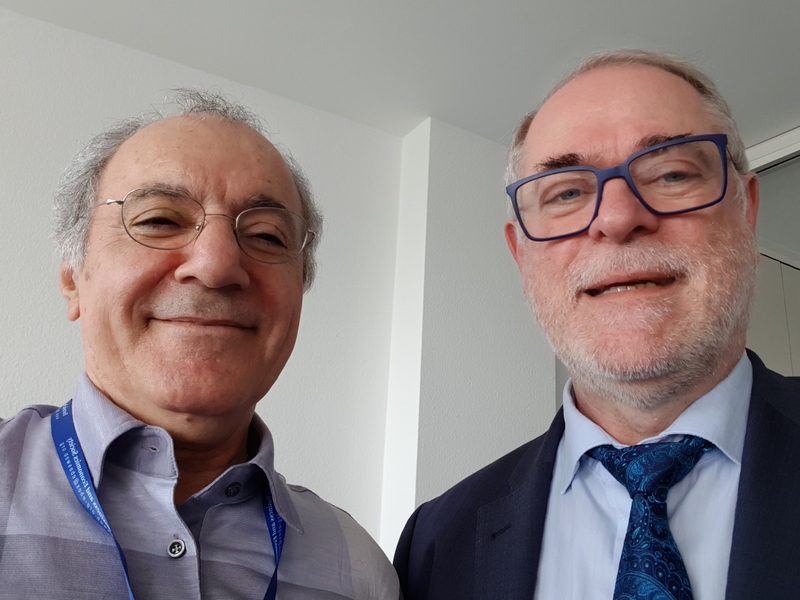 From the right: Corrado Giulietti (University of Southampton, GLO Research Director and GLO Cluster Lead Chinese Labor Market) and Klaus F. Zimmermann. They have discussed the future activities on the China program of GLO. Details of the program. 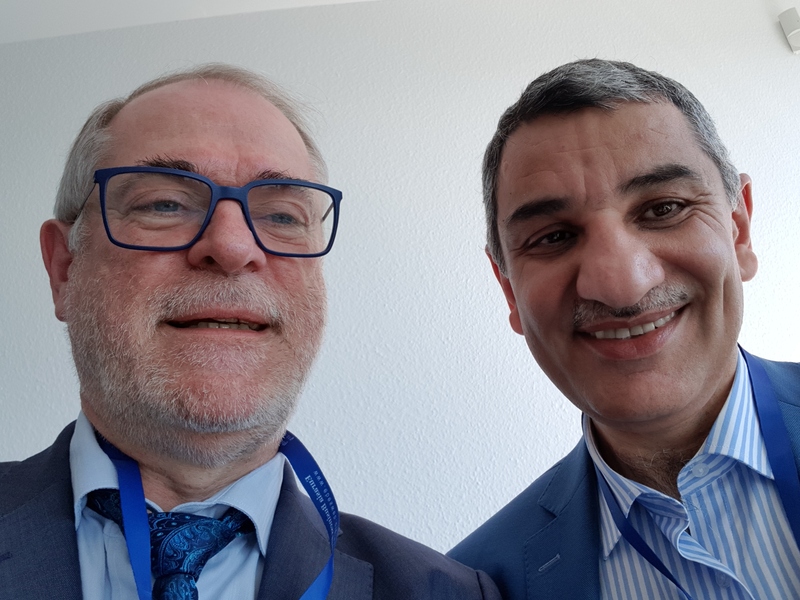 From the left: Almas Heshmati (Jönköping International Business School, Sweden, and Sogang University, South Korea; GLO Cluster Lead (i) Labor Markets in Africa and (ii) Green Employment Creation) and Klaus F. Zimmermann. Almas and Klaus discussed the perspectives of GLO initiatives in Africa. Details of the Africa program. From the right: Natig Shirinzade (Institute of Global Economic Problems and GLO Country Lead Azerbaijan) and Klaus F. Zimmermann. They have discussed joint initiatives in Azerbaijan. Zimmermann will visit Baku in November 2018. 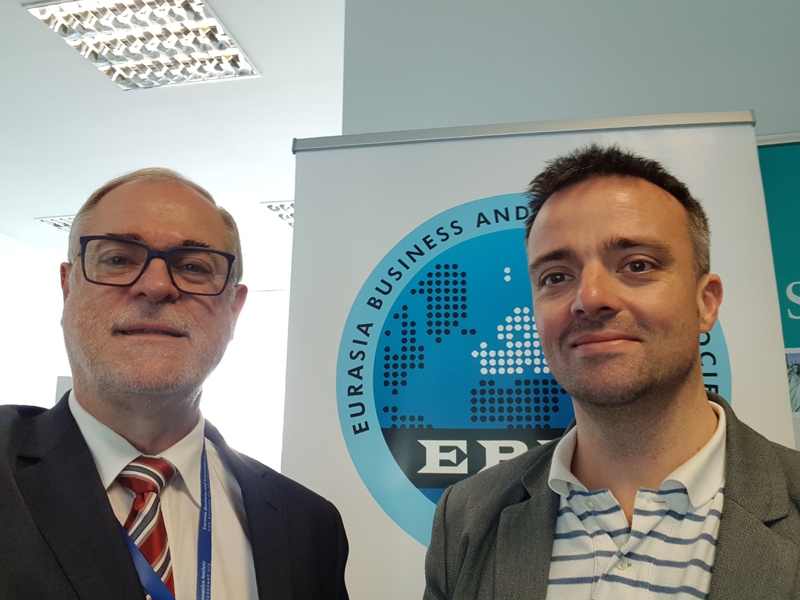 Left: Lucian-Liviu Albu (Romanian Academy of Sciences and GLO Country Lead Romania). GLO has supported various research activities in Romania, eg. in 2017 Bucharest and Brasov and in 2018 in Bucharest. 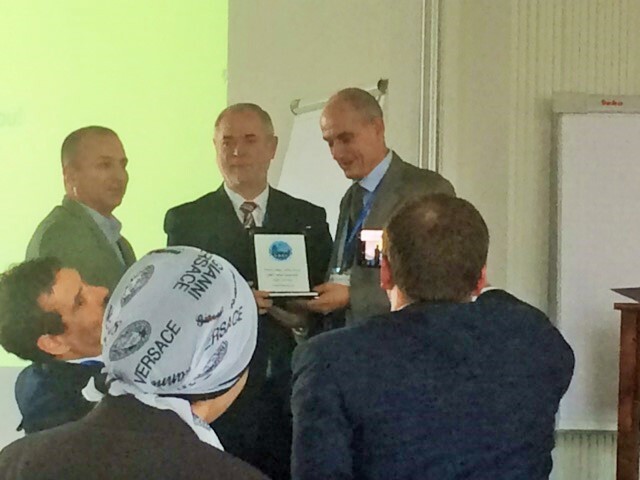 From the left: Mehmet Huseyin Bilgin (EBES Vice President, Istanbul Medeniyet University and GLO Country Lead Turkey); Klaus F. Zimmermann, receiving the 2018 EBES Fellowship Award; Marco Vivarelli (Università Cattolica-Milano and GLO Cluster Lead Technological Change of the Labor Market), who was presenting the award. 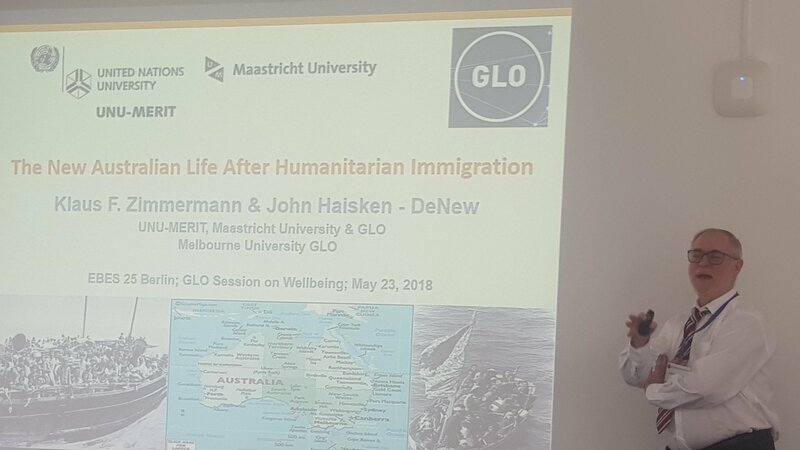 GLO President Klaus F. Zimmermann presenting his research about humanitarian migration at he EBES conference. Conference reception on the invitation of GLO. This entry was posted in Events, Media, News, Science. Bookmark the permalink.